Want a highly portable, foldable drone that shoots professional quality 4K video? You just found it. 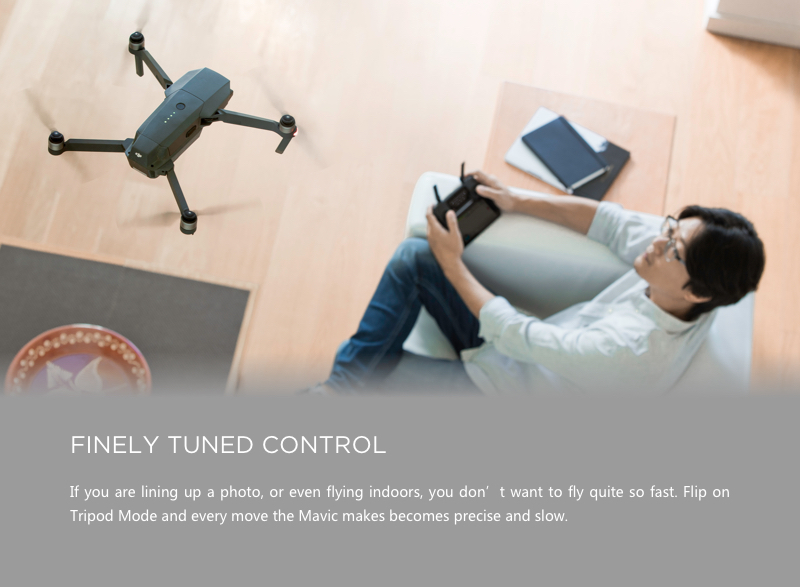 The DJI Mavic Pro quadcopter will blow you away with features and performance you normally would expect only on bigger, more expensive drones. 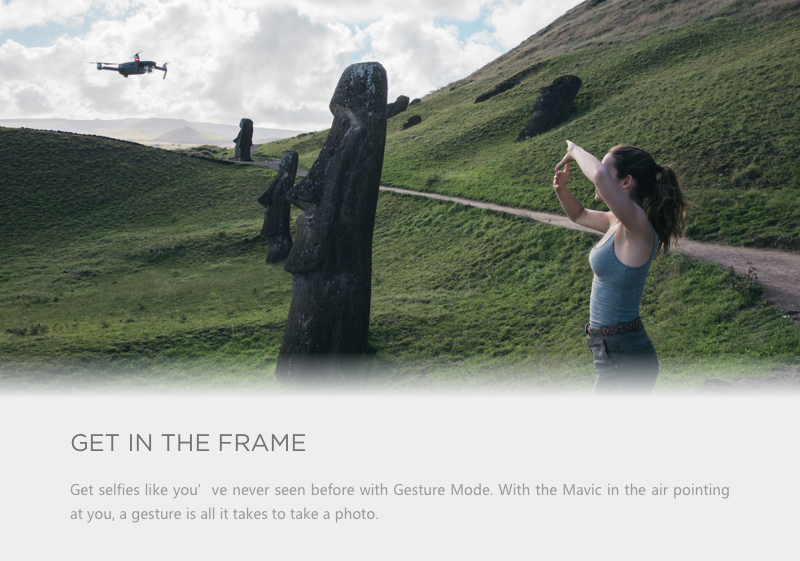 DJI packs a lot of capability — and convenience — into a mere 1.6 pounds. When you buy a DJI Mavic foldable drone from Commercial Drones, you’re getting a truly affordable professional drone. 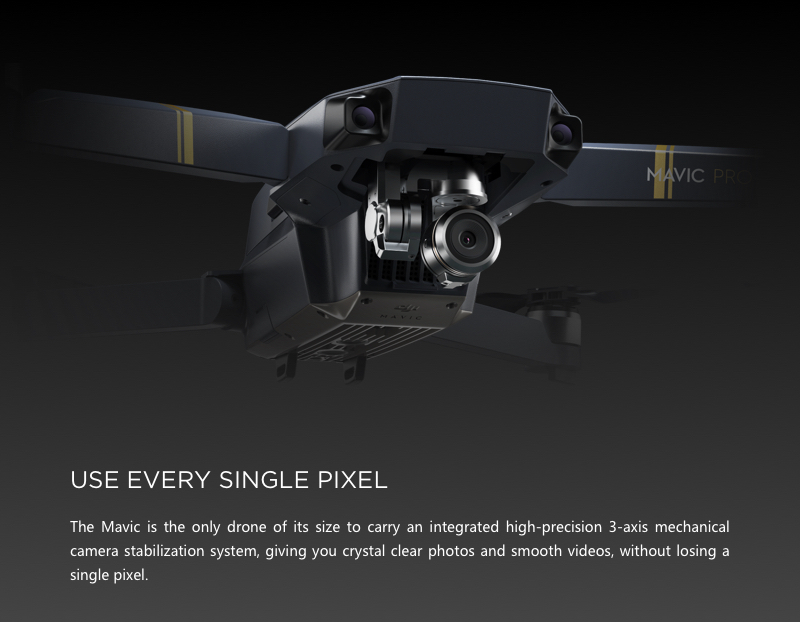 Don’t let Mavic Pro’s fun factor or its diminutive size fool you: The Mavic Pro is no toy … unless, of course, you want it to be. But when you need it to be, it’s a dependable, highly capable flying camera — every time, all the time. It generates professional-quality 4K video at 30 frames per second and high-clarity 12MP stills. The camera is stabilized by a DJI three-axis gimbal. And support from the knowledgeable, skilled, DJI-trained technicians of Commercial Drones, the largest DJI dealer in the country. We know you want to share your video ASAP. 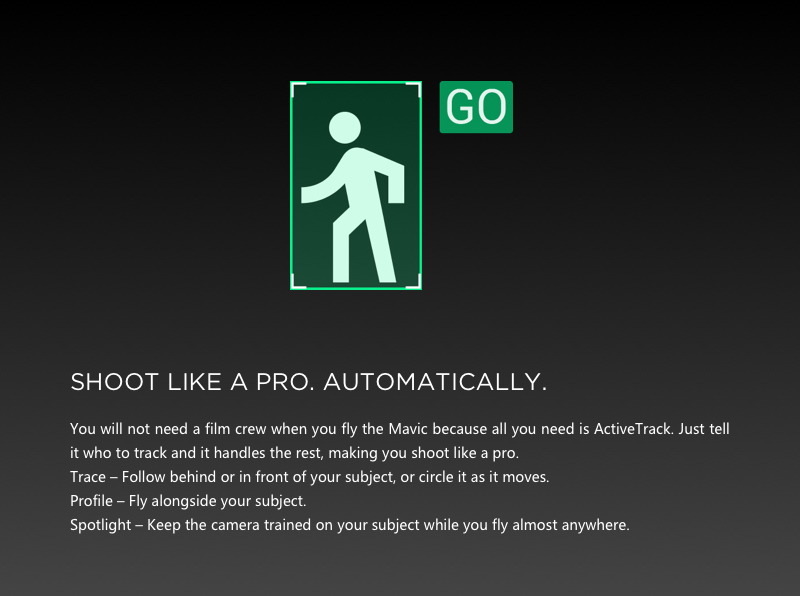 Edit it first and fast, using the DJI Go Editor to edit in your smartphone. If you don’t want to wait, stream live to Facebook or YouTube. Get your video out there on Twitter, Instagram or SkyPixel, the DJI community for sharing aerial imagery. For stills with a real professional look, shoot in Adobe DNG RAW, which will let you edit for more detail and effects. You’ll get the most out of every pixel. To get more of the accessories you want and save money, choose a Commercial Drones Mavic Pro bundle. Want to turn your Mavic Pro drone into a stabilized ground video camera? You can with the DJI Mavic Pro Drone + PolarPro Katana Handheld Stabilizer Bundle. Just twist off the propellers, fold the arms into the storage position and attach the entire drone to the katana handle. Mount your phone and connect in WiFi mode. You can shoot ground video stabilized by the Mavic’s 3-axis gimbal. Since the Mavid Pro weighs only 11.6 pounds, the setup creates no fatigue. When you want to return to the air, just reverse the process. It takes only minutes. You can also buy the Katana Handheld Stabilizer separately . Commercial Drones offers many accessories to help you get the most from your Mavic Pro flying camera. Transport your Mavic safely and conveniently with a compact Mavic shoulder bag. This economical but durable carrying bag accommodates your drone, controller, spare propellers and batteries. To hold even more accessories and get additional protection, go for a GoProfessional Mavic Pro Hard Case. This handsome alligator-style case keeps you drone and accessories snug, and it resists water and dust infiltration. An FPVLR antenna upgrade extends the range of your Mavic Pro. If you’re not very experienced at this kind of upgrade, add affordable professional installation. The Commercial Drones technicians will install an antenna upgrade for you and test it to make sure it works before shipping it back. Arrange for installation online or by calling 786-708-7807. To help you deal with any kind of light you might face while shooting, there are PolarPro Mavic lens filters. Filters are available in packs of six or packs of three. And you can always be prepared to get right back in the air with extra batteries. Charge up to four DJI Mavic pro Intelligent Flight Batteries at a time with a charging hub. The hub is smart, too, charging the battery with the highest power level first so you’re ready to fly sooner. What’s in the box? 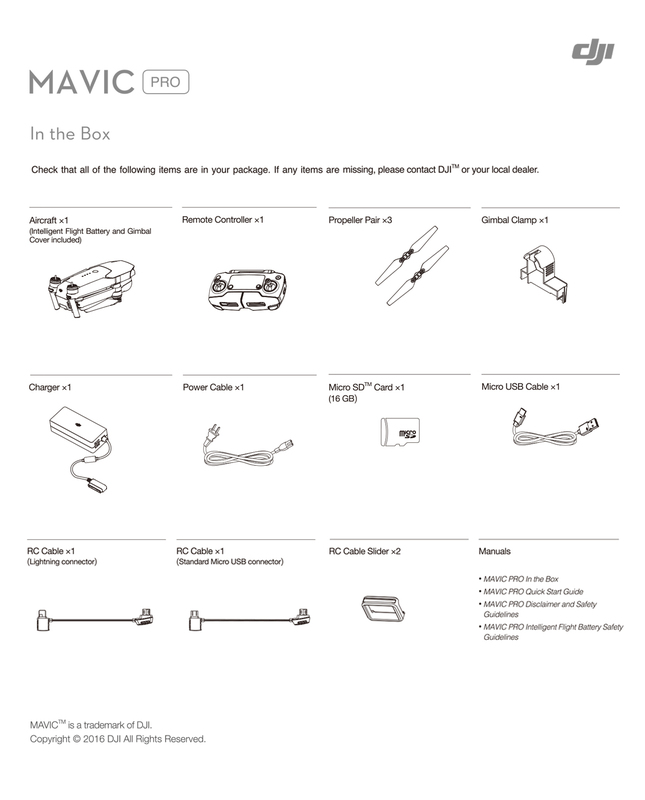 The DJI Mavic Pro, remote controller, charger, power cable, three propeller pairs, gimbal clamp, 16GB microSD card, micro USB cable, radio control cables, radio control cable slider, manuals. I’ve never flown a drone before. Will I lose control? 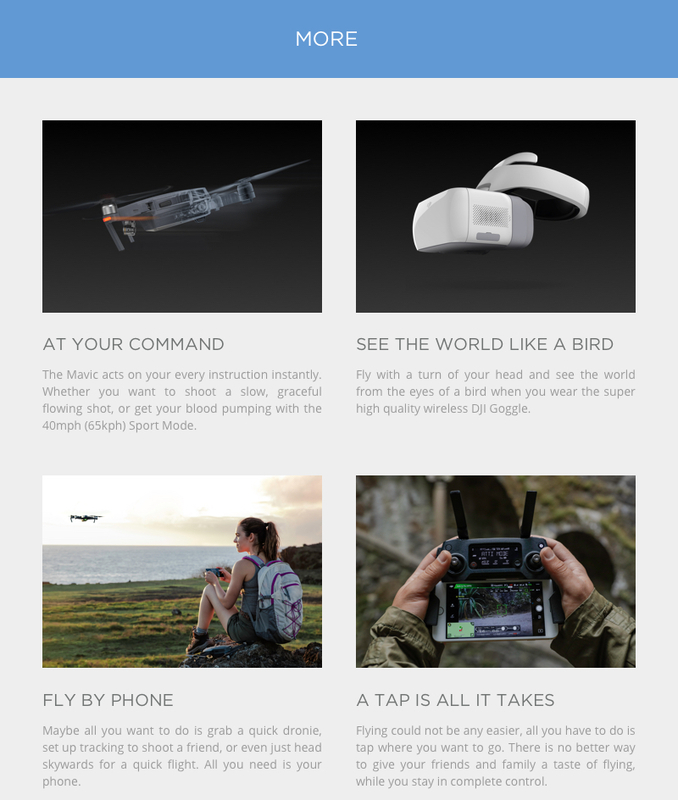 Beginner mode lets you ease into learning the commands and how your drone reacts. You can set the flight program to a more advanced mode when you’re ready to graduate. Does the Mavic Pro record 4K video? Yes. 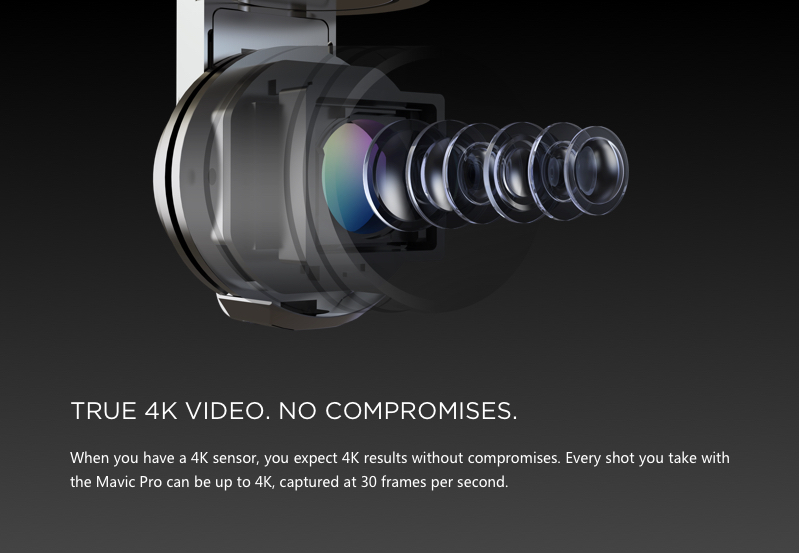 The Mavic pro camera shoots genuine high-definition 4K video in 30 fps or 2.7K video. How do I edit and share video? You can edit and share with just a few taps right in the DJI Go 4 app. Do I see what the camera sees? For the most part, yes. Images are not streamed in 4K video, but they are always in HD. When the drone is nearby, video is streamed in 1080p. 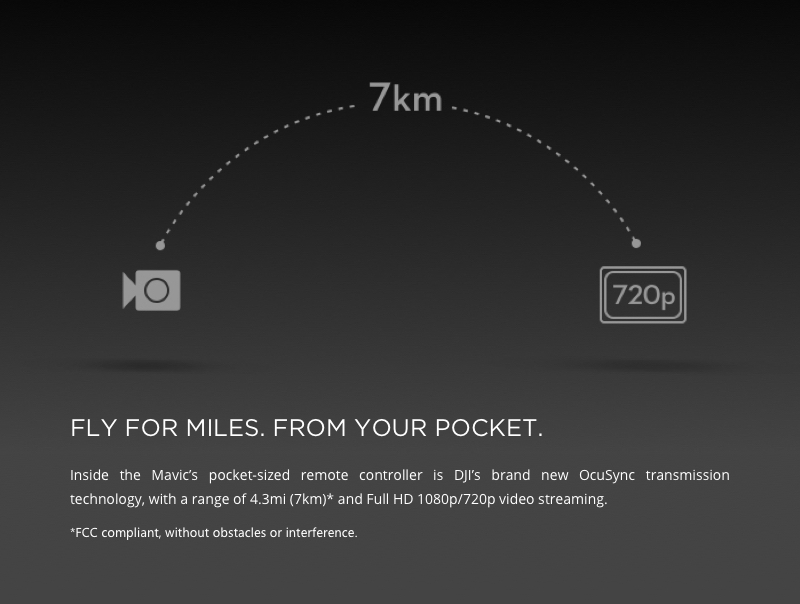 Farther away, and up to 4.3 miles, video streams in 780p. You’ll record in 4K or 2.7K while seeing in 1080p or 720p. Is Mavic Pro video smooth? Is it shake-free? Video is stabilized by a 3-axis mechanical gimbal. The gimbal compensates for the drone’s movements to produce silky smooth video comparable to what is shot by other 4K quads and better than what’s produced by other compact drones. Can the Mavic Pro shoot stills? The Mavic pro shoots stills at a sharp 12MP resolution. The shutter ranges from 8 seconds for time exposures to action-freezing 1/8000 second, as fast as on many handheld SLRs. It can shoot bursts in 3/5/7 fps. Is the camera removable for ground shooting? No, the camera is permanently mounted. Can I use the Mavic Pro for ground shooting? Yes, and quite easily. The Mavic is so light and compact, you can remove the propellers and fold the arms to the storage position, then handhold it and shoot. The 3-axis gimbal on the drone that steadies aerial video will also steady handheld video. For less cumbersome handheld shooting, you can add an inexpensive PolarPro Katana–DJI Mavic Tray, a highly effective handheld system that makes the drone easier to handle. Can I insert more memory than the standard 16GB microSD card has? Yes, up to 64GB. How fast can the Mavic Pro fly? 40 mph in Sport Mode. 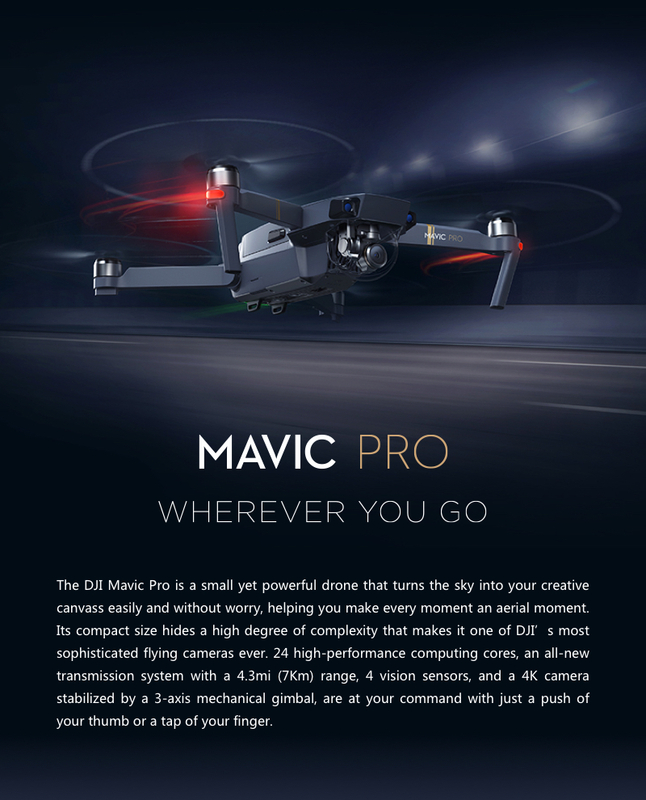 What is the Mavic Pro range? 4.3 miles. Range extenders are available. What is the maximum Mavic Pro flight time? 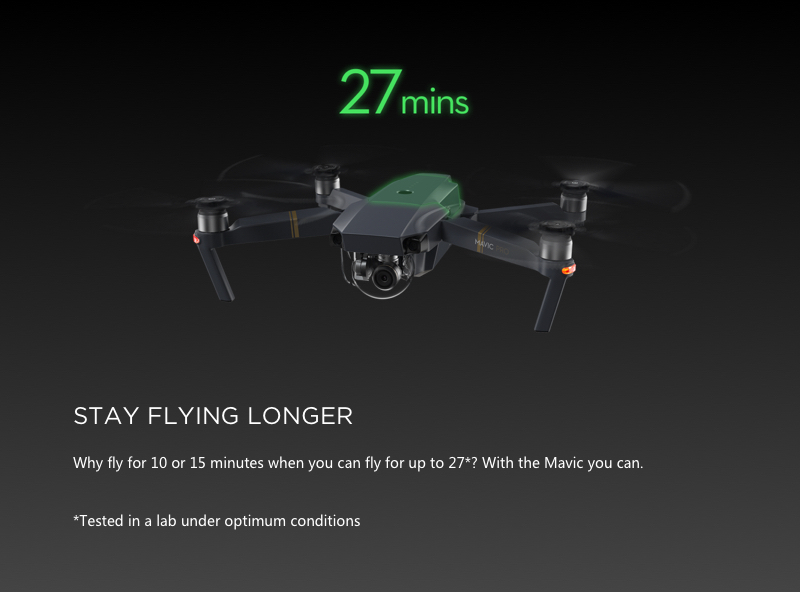 The Mavic Pro has been tested for up to 27 minutes. You’re more likely to experience flight time of about 21 minutes. What happens if my battery runs low? 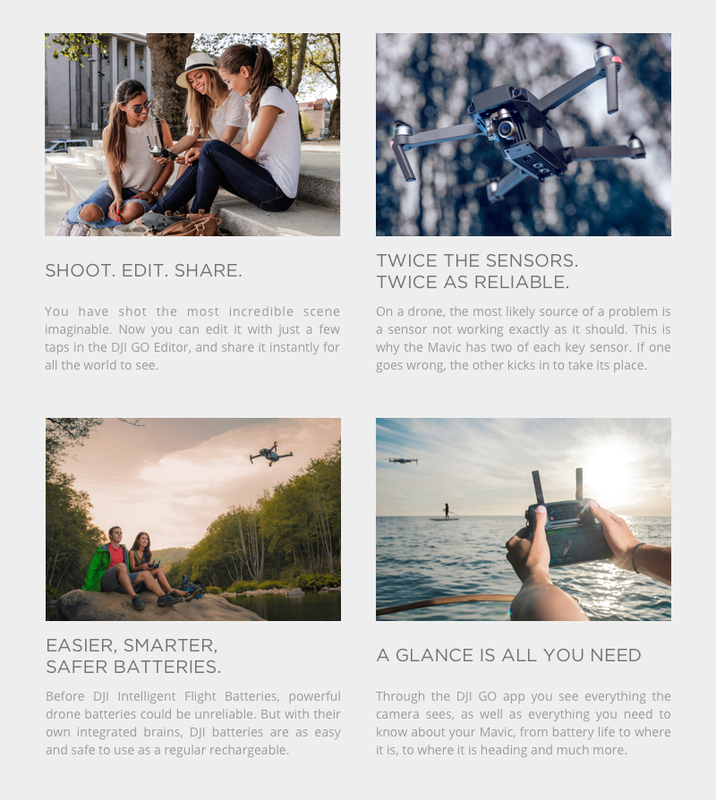 The included DJI Go flight program tells you how much power you have in reserve. If you’re concentrating on your aerial shoot, or just having too much fun, the Mavic automatically returns to home when the charge runs low. It remembers where it came from, safely finds its own way home, recognizes the spot where it took off and lands there. If the Mavic automatically flies home, does it avoid obstacles? 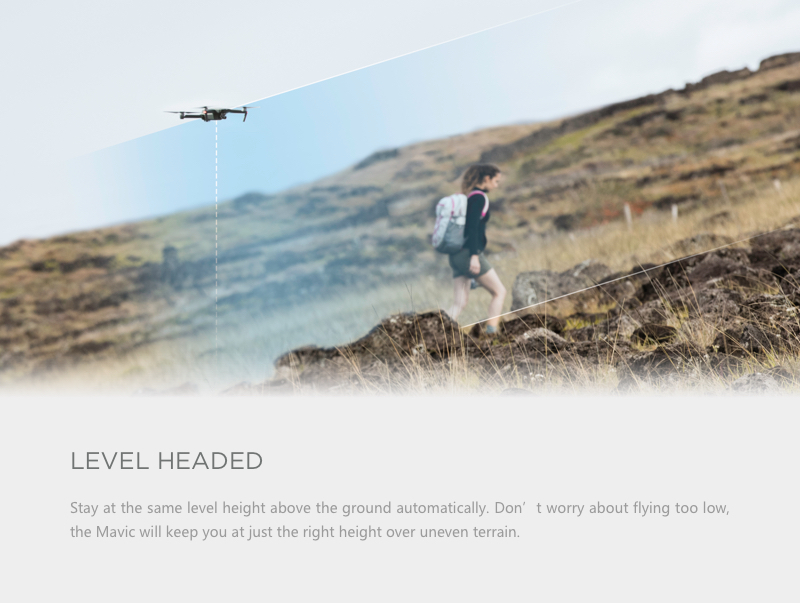 In Return to Home mode, whether you or the flight program activates it, the drone automatically senses obstacles and the Mavic flies around or over them. Does the Mavic avoid obstacles when I’m in control? Yes. 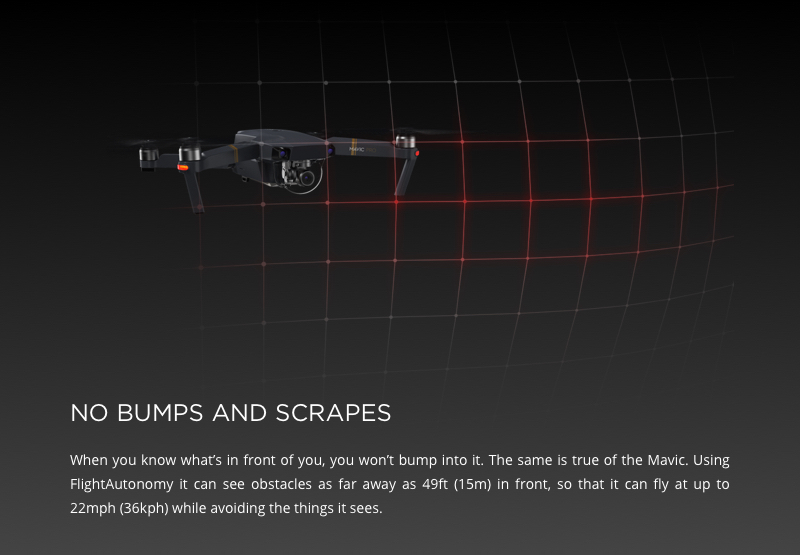 The Mavic Pro senses obstacles up to 49 feet away when it’s flying up to 22 mph. It stops before hitting an obstacle and hovers. It also senses obstacles if you use Tap Fly and it is going to the place on your screen that you have tapped. Can I fly the Mavic Pro indoors? Vision sensors for the front and bottom help you fly safely indoors, where GPS may not be effective. Mavic senses obstacles as close as 2 feet in front of the drone. What happens if the GPS isn’t available? The Mavic Pro also recognizes signals from GLONASS, the Russian satellite system. If neither is available, you can fly by visual sensors. You can also use tap fly to show the Mavic where you want it to go. Can I fly without the remote control unit? You can fly with your smartphone only, once you have downloaded the app. Will the Mavic lock onto my subject? 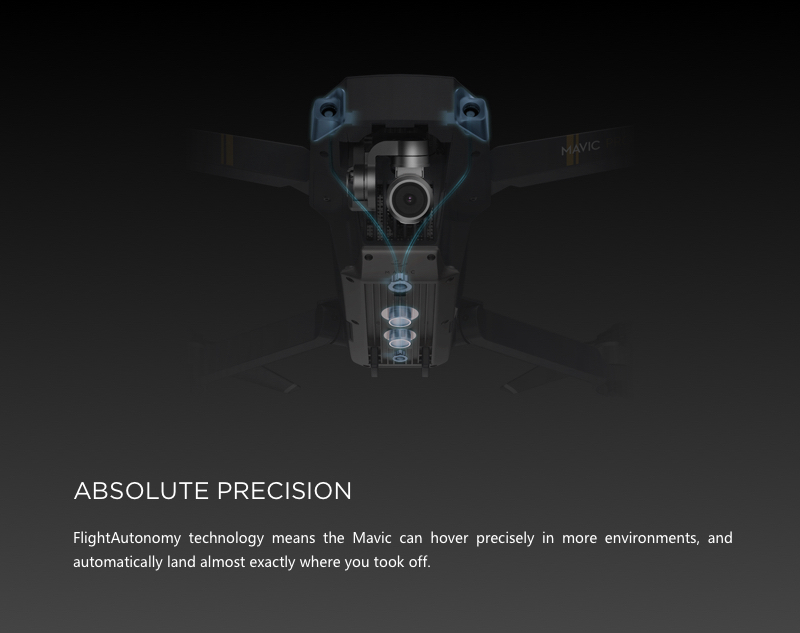 The Mavic has several modes that lock onto your subject or onto you: ActiveTrack locks onto any subject the drone is told to follow. Trace lets the drone follow a subject, back up in front of it or circle it. In Profile mode, the Mavic travels alongside the subject. Spotlight keeps a still subject in focus while you fly up, down or around it in search of the most interesting angles. Will the Mavic Pro shoot an aerial selfie? Yes. Just learn the hand commands, and it recognizes them.